In the 2015 International Series we saw the Dolphins v Jets, the Jaguars v Bills and the game I had tickets to, Lions v Chiefs. 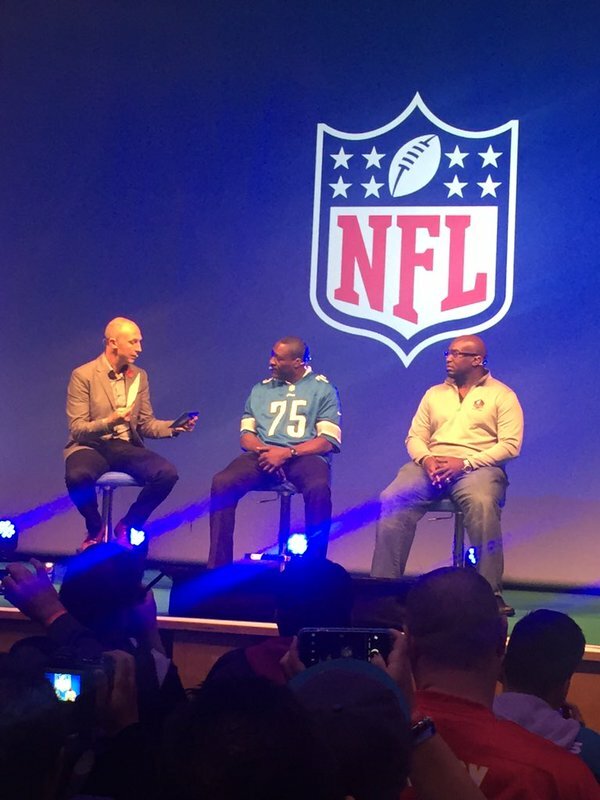 Despite no fan rally on the Saturday the NFL UK team organised a fan forum where we got to ask questions to NFL Hall of Fame members Barry Sanders, Will Shields, Christian Okoye and Lomas Brown. To our surprise (or perhaps just mine if the announcement was miss), we were also joined by NFL Commissioner Roger Goodell and Clark Hunt the Chairman of the Board of the Kansas City Chiefs. Click any of the videos below (plus full gallery of the weekend at the end of this blog) to see the Kansas City Chiefs Cheerleaders opening the NFL Fan Forum, to see Will Shields and Lomas Brown demonstrate some moves as well as Barry Sanders, Will Shields, Christian Okoye and Lomas Brown play a game of ‘Finish the sentence’. When Sunday came, I knew there was a fan plaza but very little had been said about it so I wasn’t sure what to expect but there was a huge New Era store where I finally got my hands on a Seahawks bobble hat, and a huge NFL store with jerseys, tees, jumpers and other goodies. 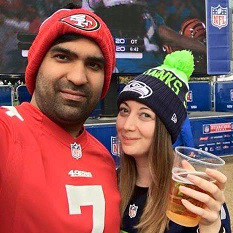 I even treated myself to a Calvin Johnson jersey, something I wanted to get at the last game but didn’t get around to – little tip, don’t buy from the NFL stores, they charge £70 for a women’s jersey, I went to the Nike store at Wembley and got the same jersey for £56. There was a great atmosphere around the whole of Wembley stadium, and I’d say every team was represented with some fans even dressing up for the occasion, not only that but fans from the US and Europe had even made a special trip over. I also got to meet some fellow NFL fans, including The Kilted Texan. We were really lucky that we won some tickets for Club Wembley – it was a pretty incredible experience. We didn’t have a package, just simply the tickets which meant we could go in earlier and leave later than fans elsewhere in the stadium, we had more choice in the concession stands including a Costa Coffee, An ale bar, a champagne bar plus your seats were cushioned for that extra comfort, yes it’s double the price of what I’ve paid in previous years but I’d say it’s worth it and I’m tempted to do it next International Series. When I initially heard that Madness were performing I wasn’t particularly impressed but they were good and they did get the crowd going. Following their performance, both teams made their way on to the field, see video below of the incredible entrance by Kansas City Chiefs, as well as both the US and UK National Anthems. Having seen Lions play previously, plus some love for former Seahawks player, Golden Tate, I wanted to see them win again however it just wasn’t meant to be. Otherwise, it was a great day, an incredible game by Kansas City Chiefs. I’m hoping we’ll get three great games again next year, and even more build up – keep up the good work NFL UK!